This section contains guidance for all those involved in planning for excellent RE. There is advice on how to arrange the study units for your school curriculum: including splitting the units up so that they are revisited over a key stage, and how to employ different methods in teaching. 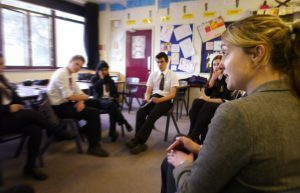 There is particular guidance for each key stage, for pupils with special educational needs and disabilities (SEND) and on where to find resources for teaching about non-religious worldviews. Also included here is the Religious Education Council of England and Wales’ Code of Practice for RE teachers, and a Code of Conduct for RE visits and visitors. For Governors, there is advice on how to hold productive conversations about RE and collective worship and what their responsibilities are, and for RE Subject Leaders there is a guide for self-evaluation of RE provision and quality.